The perfect Halloween treat with pecans, pumpkin, almond paste and vanilla. Chop pecans and dates into small pieces and knead them together to make dough for your tarts. Put the dough into a greased tart or muffin tin and place it in the freezer. Chop the unpeeled pumpkin and peel the orange. Puree both in your blender. Next add agave syrup, coconut oil, almond paste and blend again. Season your filling with vanilla powder, cinnamon and ginger. Add a little water if necessary. Take the tart base out of the freezer and fill each piece with the raw pumpkin mixture. Put the tarts back in the freezer and let them set. Now they are ready to eat! Enjoy every moment! 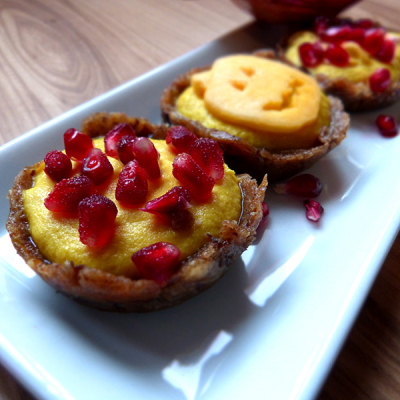 Lena’s Tip: Decorate your raw treat with pomegranate seeds and pumpkin pieces. The perfect Halloween dish! Made with love.